Black Diamond HoodWire Rackpack. 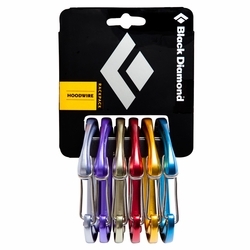 With six hot-forged HoodWire carabiners color-coded to match your Camalots, C3's or X4's, the Black Diamond HoodWire Rackpack makes it easy to find the right piece when you have a big rack and the pump clock is ticking. By employing an innovative stainless steel wire hood, our HoodWire Technology gives these biners the snag-free benefits of a keylock with the weight savings of a wiregate.